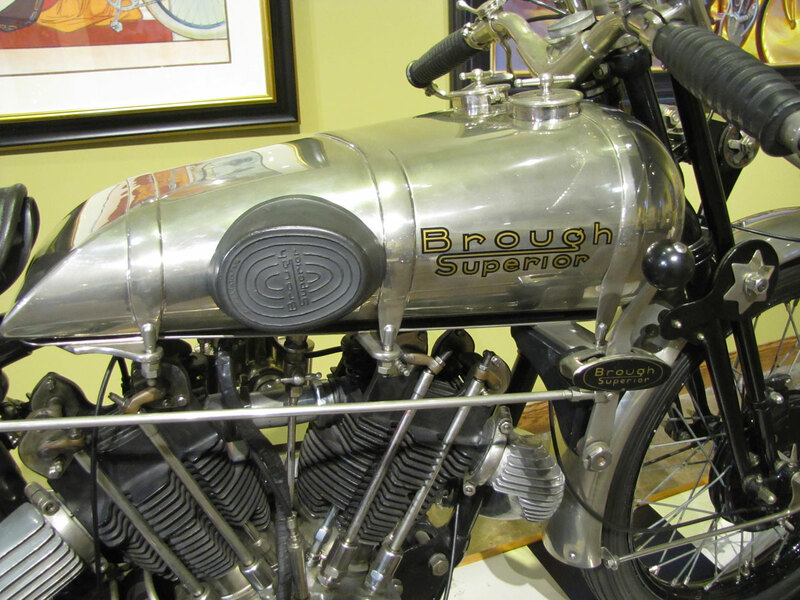 George Brough, the son of William E. Brough, raced his father’s motorcycles, then went on to make his own, eventually dubbing them Brough-Superiors. 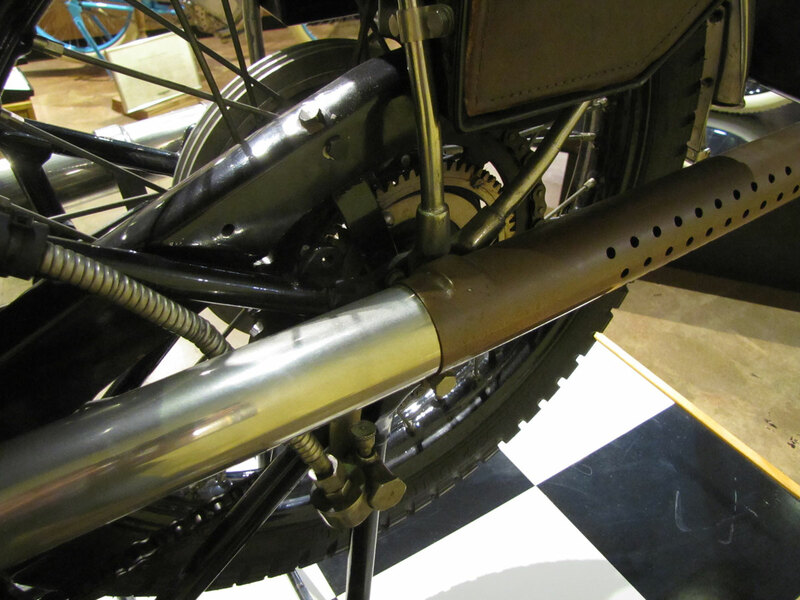 George Brough’s personal SS80 became the first flat-head production motorcycle to hit 100 mph while lapping at the banked, concrete-paved British speedway named Brooklands. 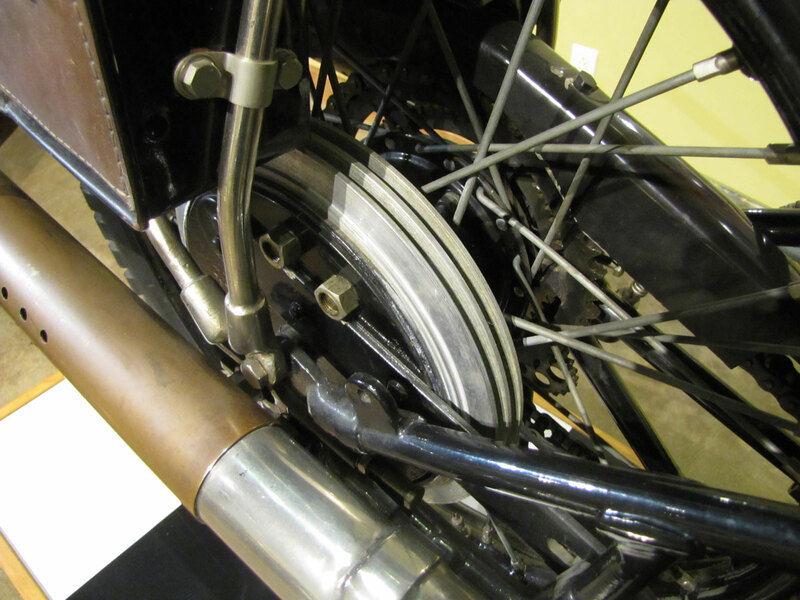 The Pendine was Brough’s high performance machine. 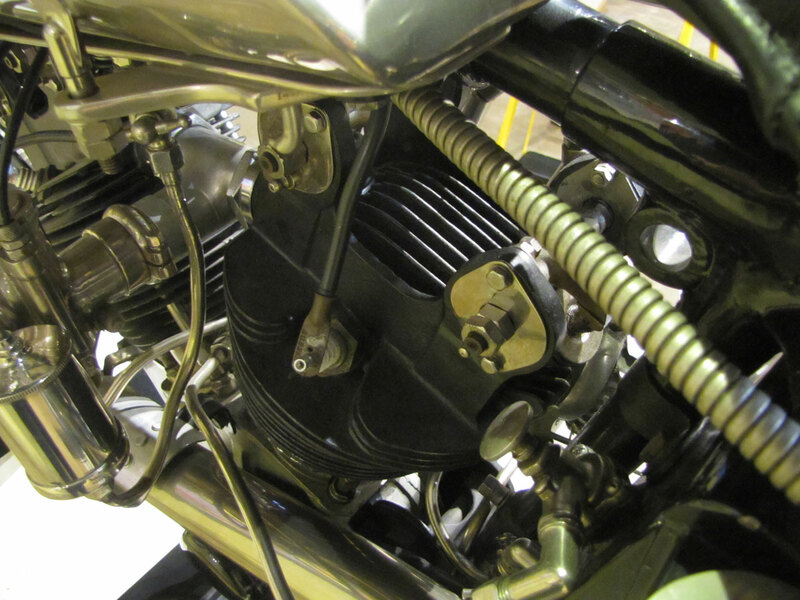 But it’s also a feast for the eyes of anyone who enjoys fine machinery. 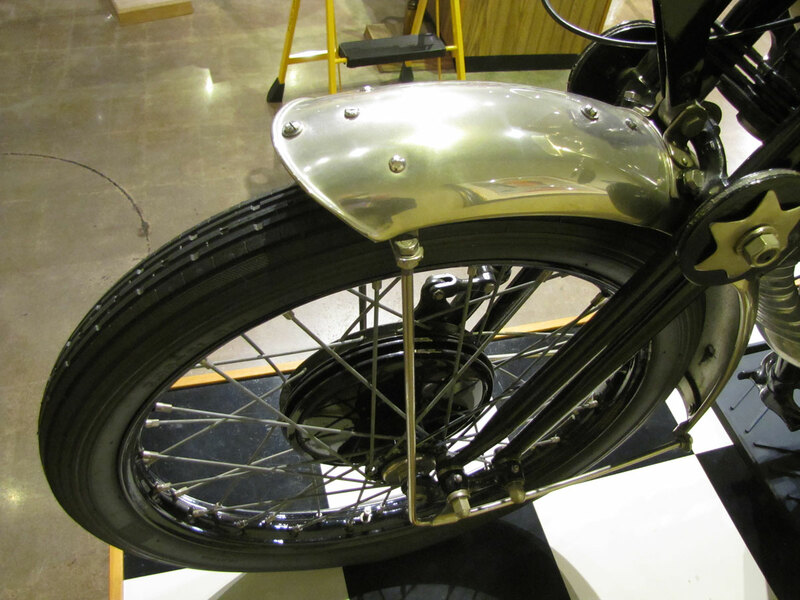 As these included photos attest, Brough took great pains to separate his machines from the typical bikes of England at the time. 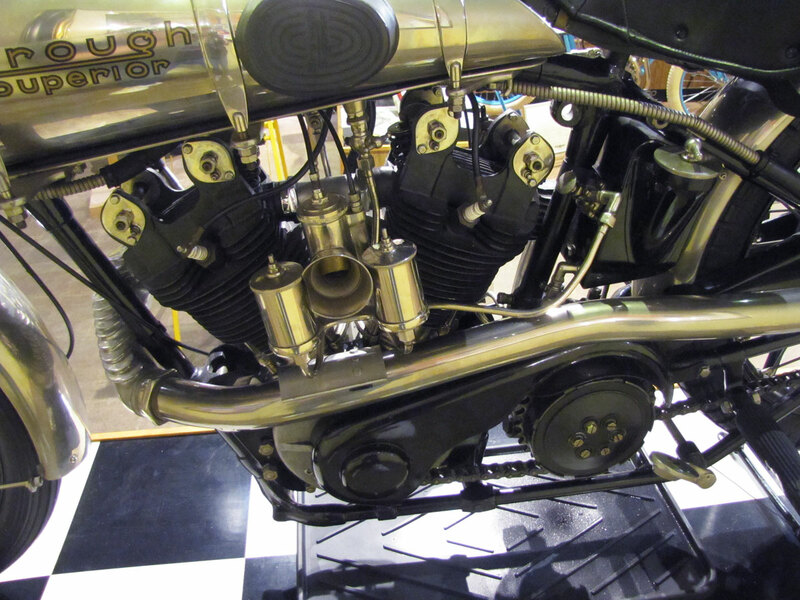 Note the outboard pivot handlebar controls, the nickel plated fuel and oil tanks, the great finned exhaust manifolds and brake drums, the open valve train, grand nickel plated remote floats for the carburetor with an open velocity stack. 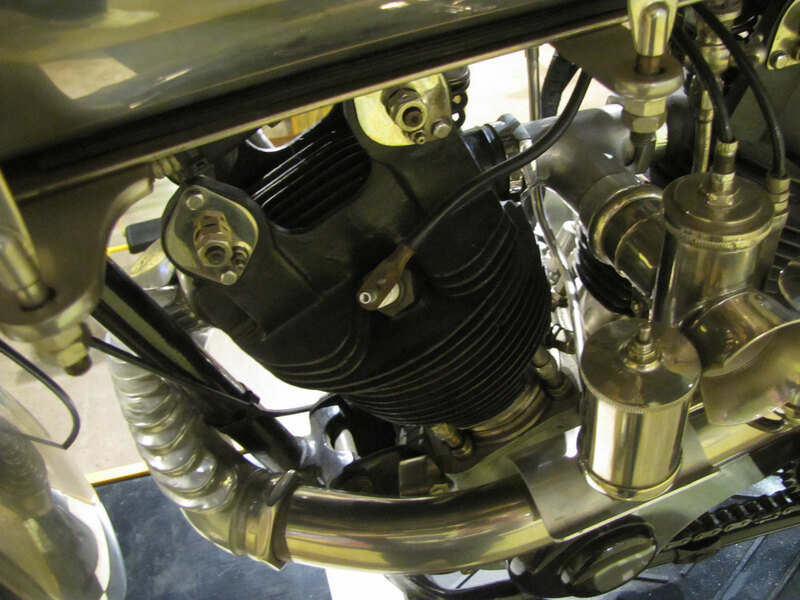 Friction dampers have star motifs and the fuel tank transfer offers the Super Sport legend. 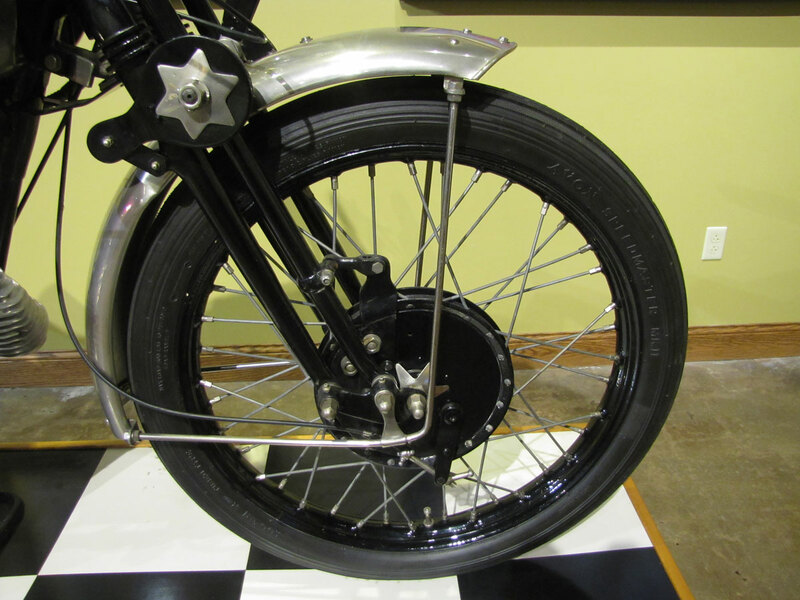 Yet steel wheel rims are a purposeful black enamel. 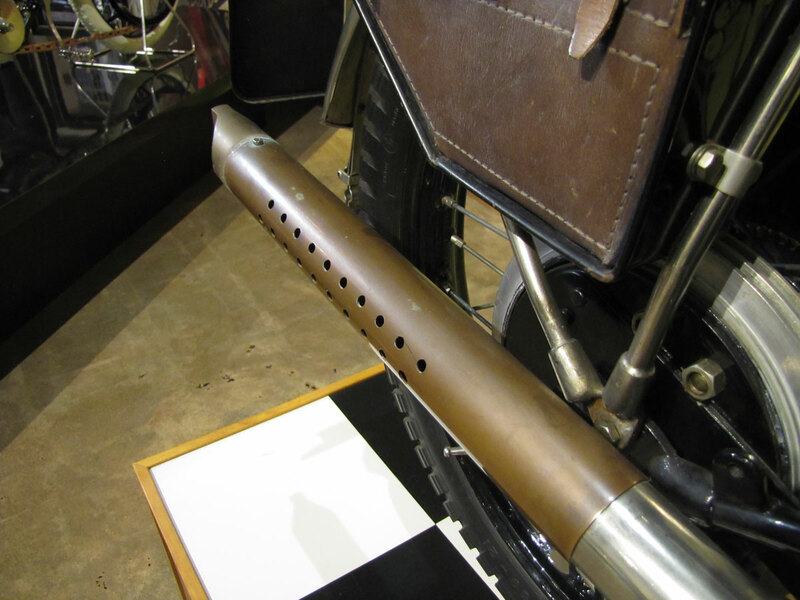 “Every S.S.100 Pendine model is guaranteed to have been timed to exceed 110 m.p.h. 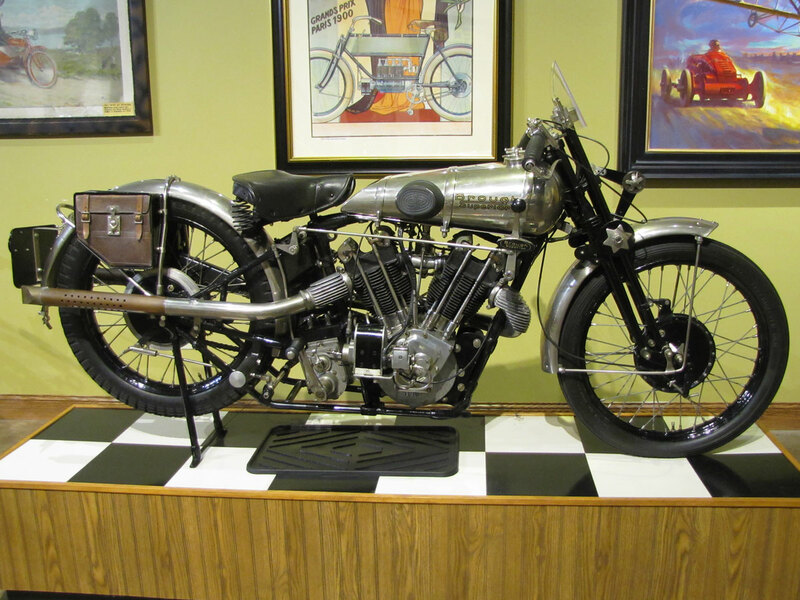 before delivery to the customer,” is from the 1927 sales catalog. 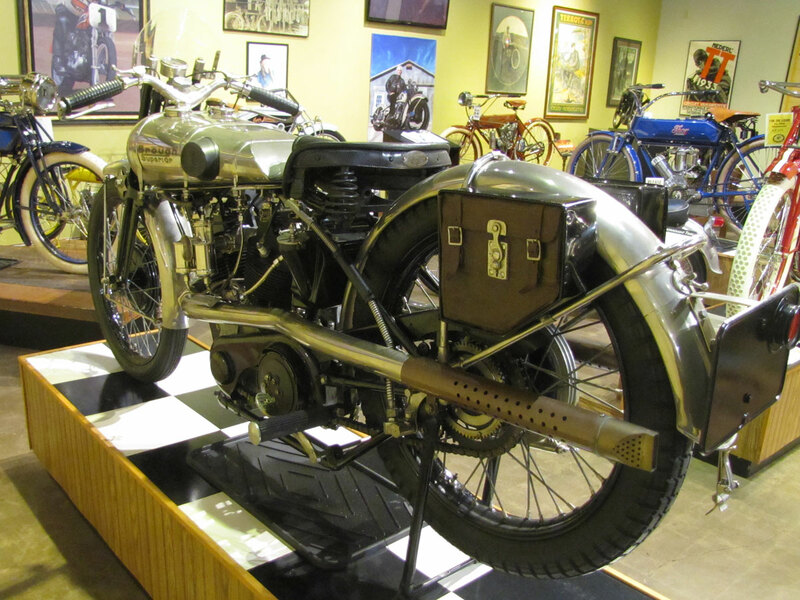 Elegance, performance and limited production are what have made Brough (pronounced like “bruff”) motorcycles world renowned as the best out of England and Europe before World War II; most would say they were the best in the world at the time. 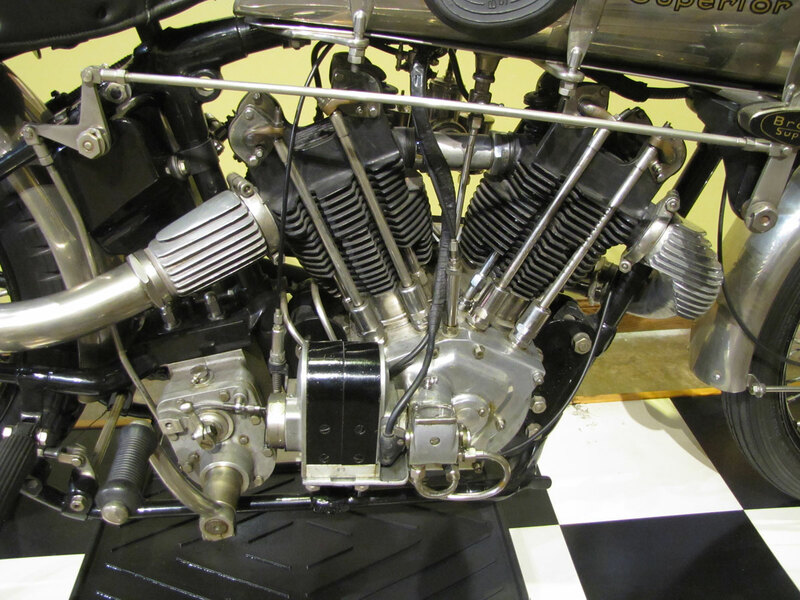 In 1927 the thirst for speed was strong in England. 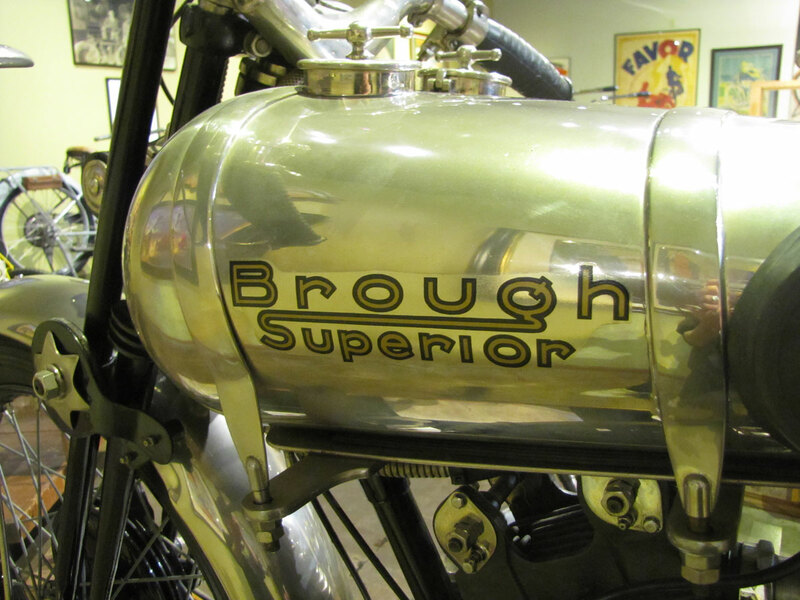 George Brough was thirstier than most. 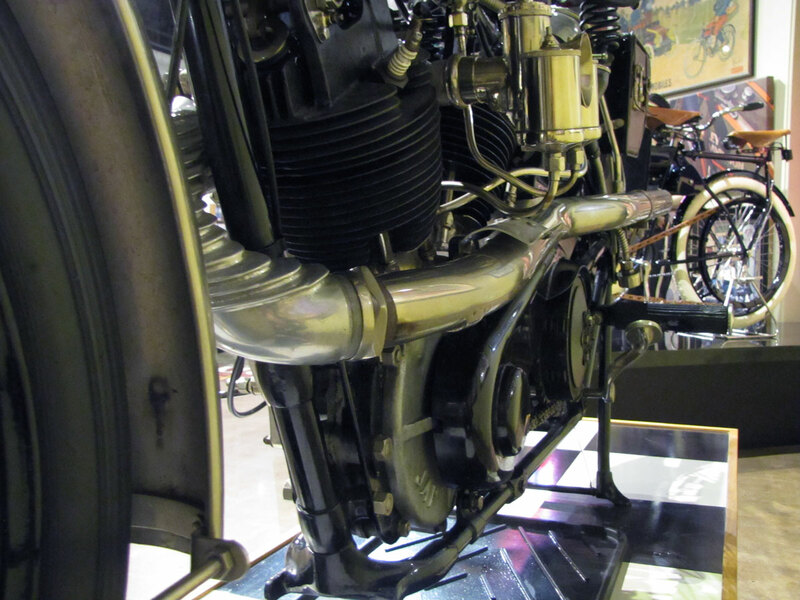 Pendine Sands, a seven mile long, firm, flat expanse of beach on the south coast of Wales, some 220 miles west of London, was the place for land speed record runs. 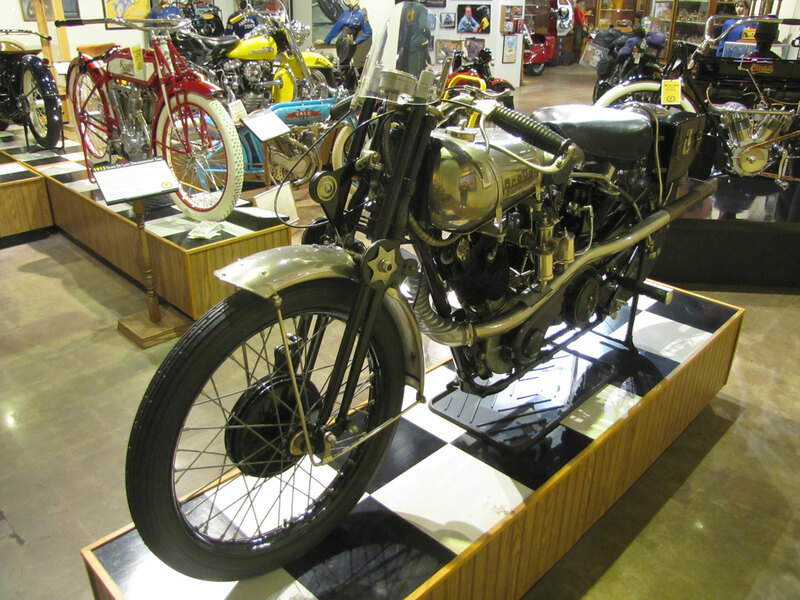 Excepting Glen Cutiss’s run on a motorcycle powered by a V8 aircraft engine, George Brough’s 1928 recorded speed of 130.6 mph on an SS100 was the fastest speed in the world for a solo motorcycle. 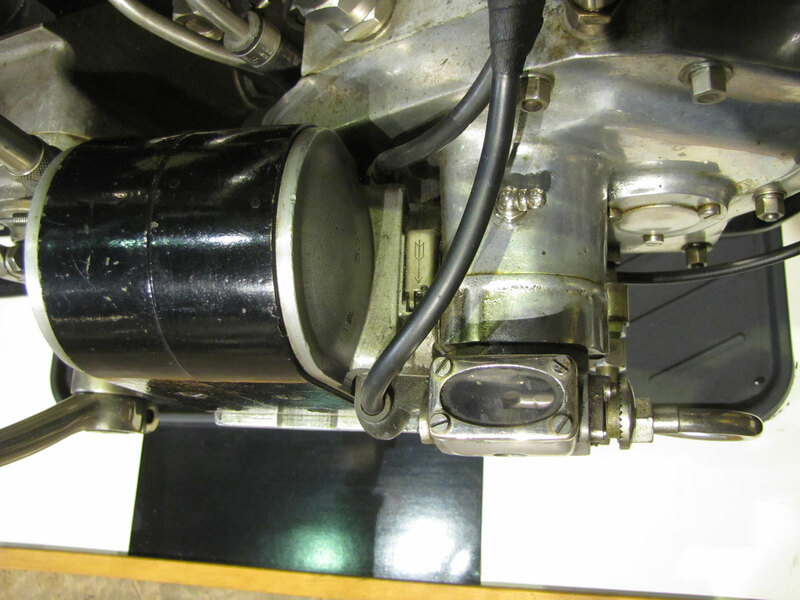 Some report he blew the engine on the return run so there was no official record. 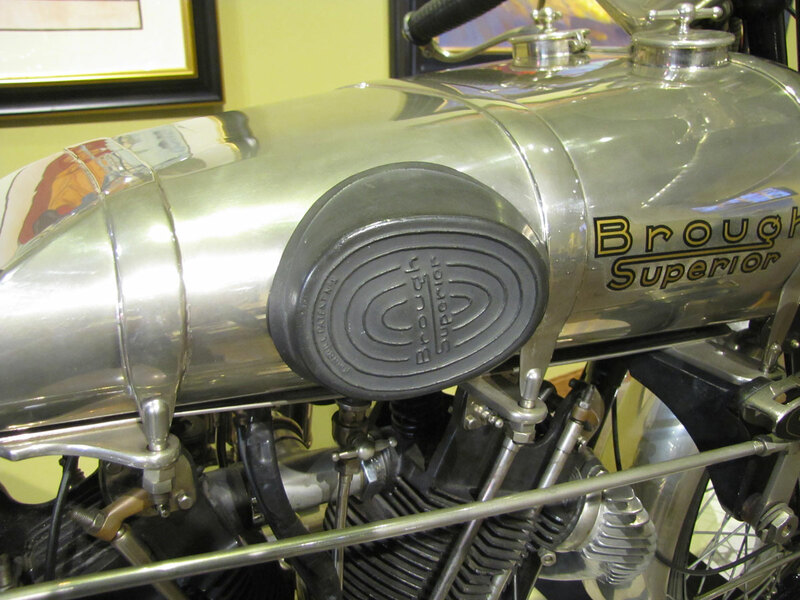 Clearly the SS100 was a very fast machine in its day, and Brough capitalized on performance feats and striking appearance to promote his machines. 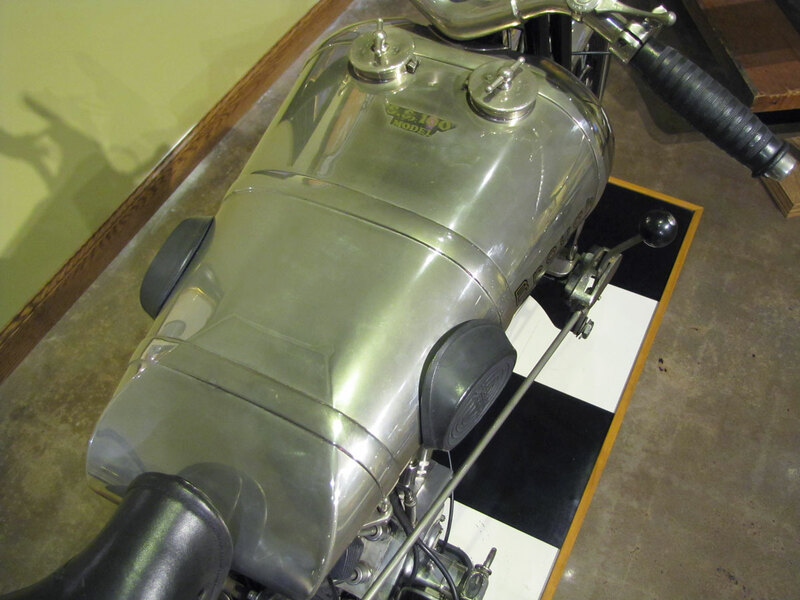 Each Pendine model was a SS100 fitted with what we would call today “a factory race kit.” A specially tuned high compression engine is installed and the magneto is driven by bevel gear. 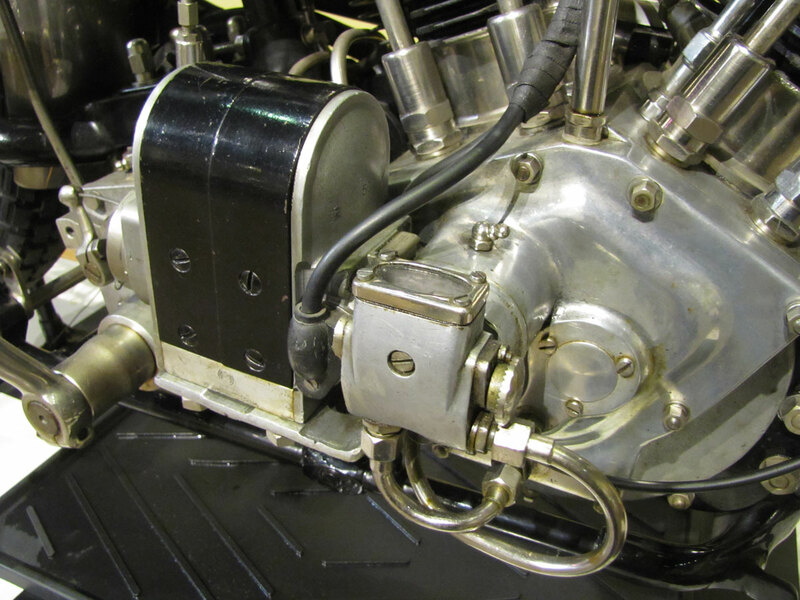 Carburetion was handled by a dual remote float carburetor. 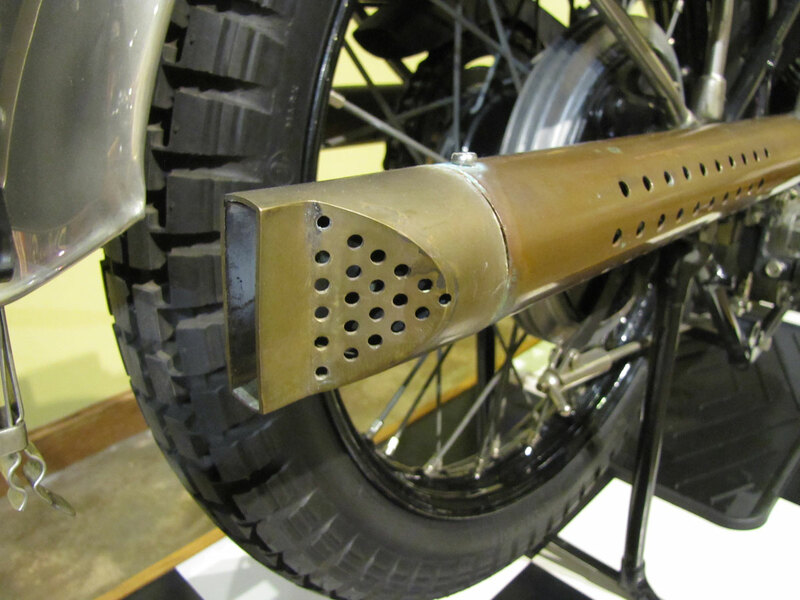 The sleek exhaust pipes are high level, baffles at the tips. 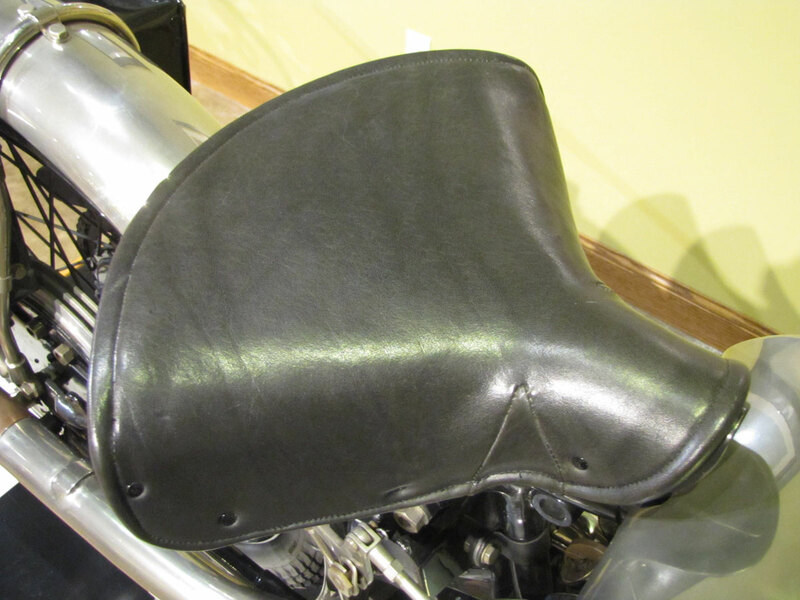 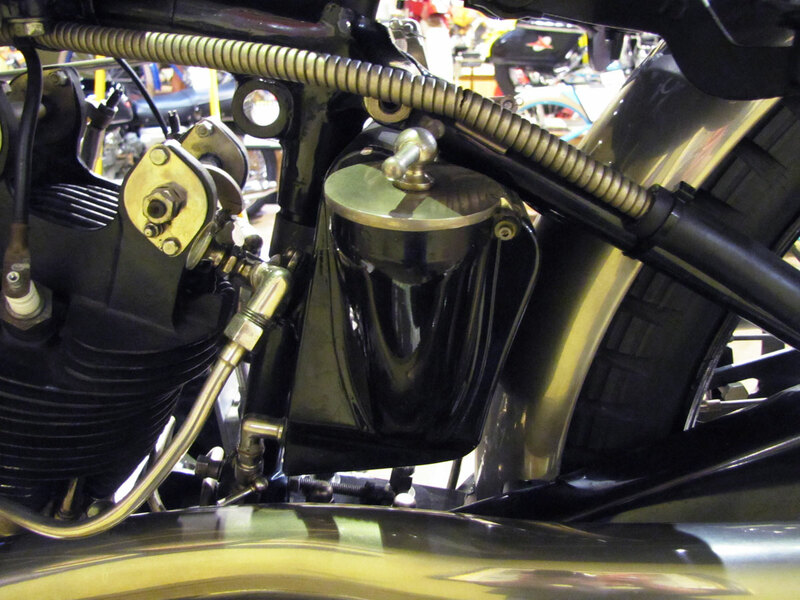 Other modifications are lower handlebars, rear set footrests and typically no kick-starter. 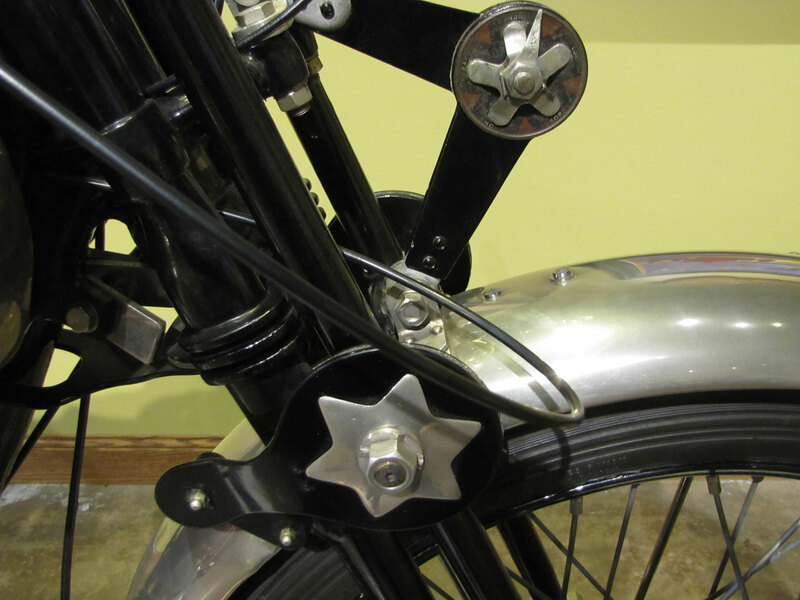 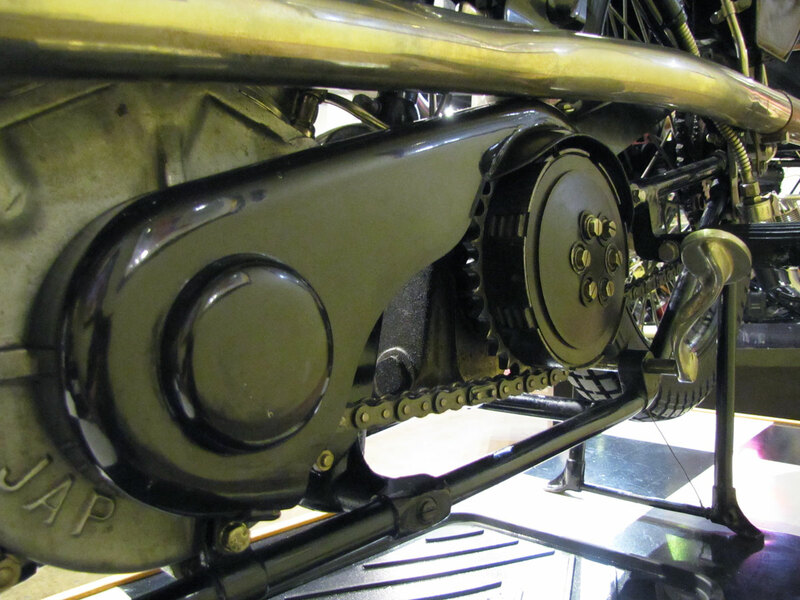 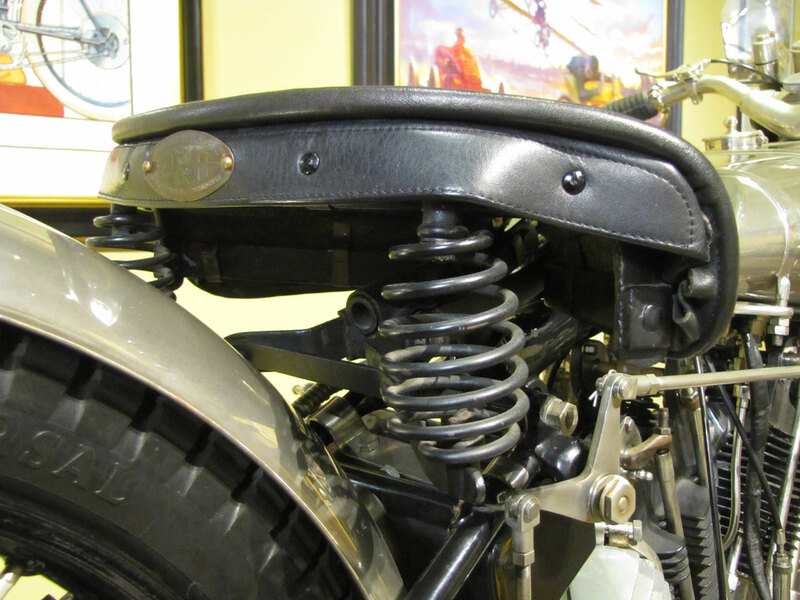 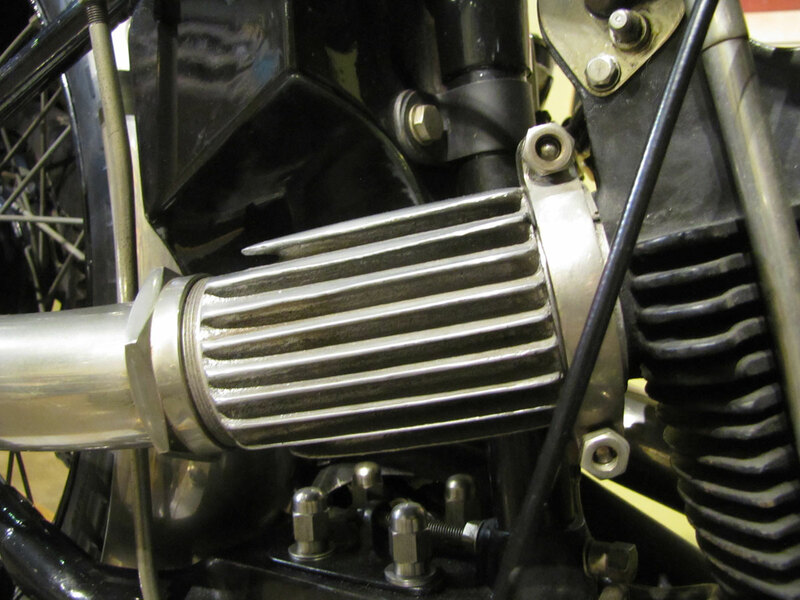 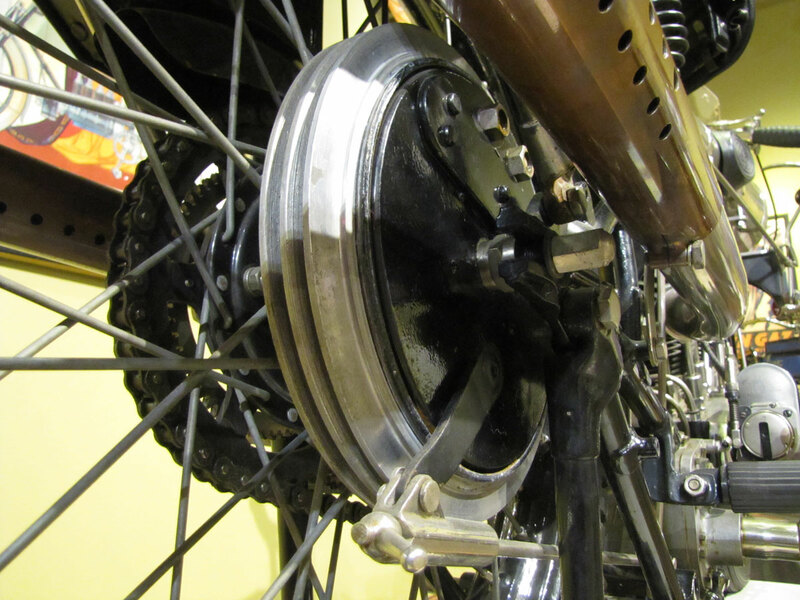 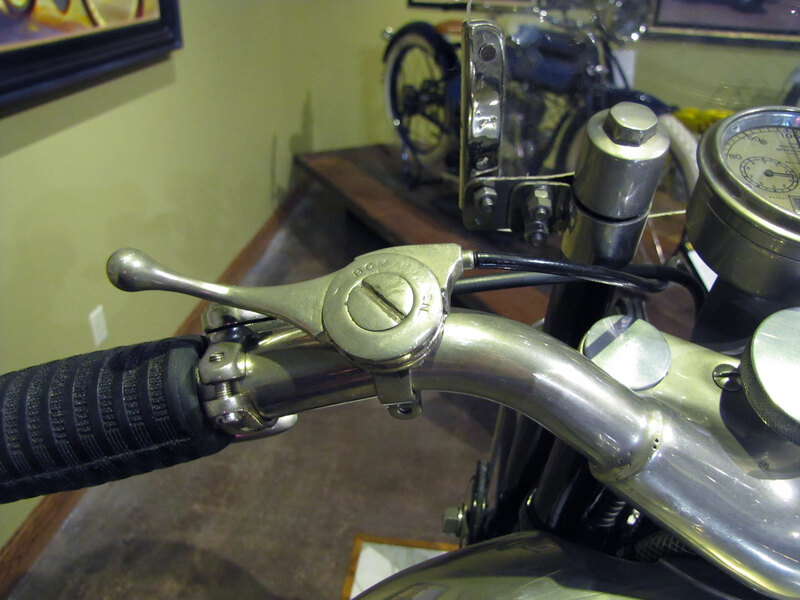 Brough manufactured few components in-house but rather sourced the best engines, transmissions, hubs, at one point even adapted the Harley-Davidson fork design. 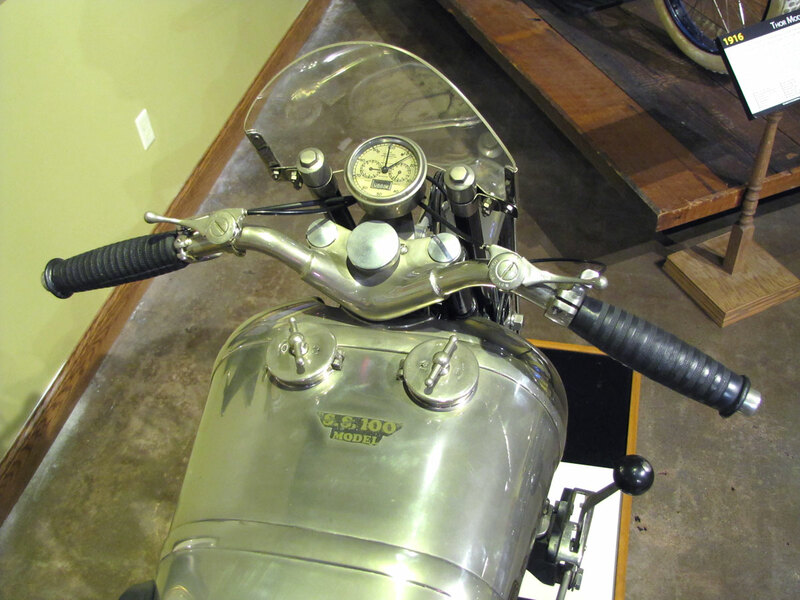 This SS100 is fitted with the J.A.P. 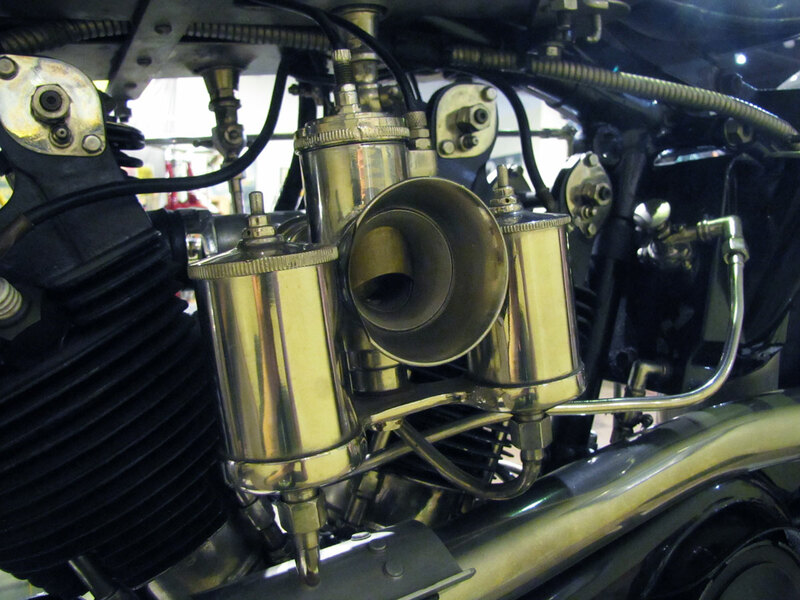 KTOR twin-cam 998 cc 50° v-twin made by J.A. 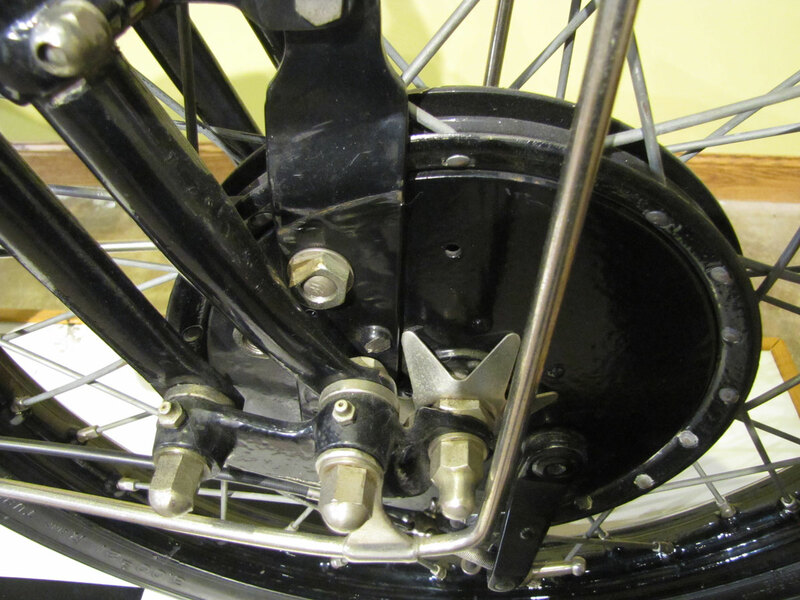 Prestwich of London and uses a Sturmey-Archer three speed gearbox. 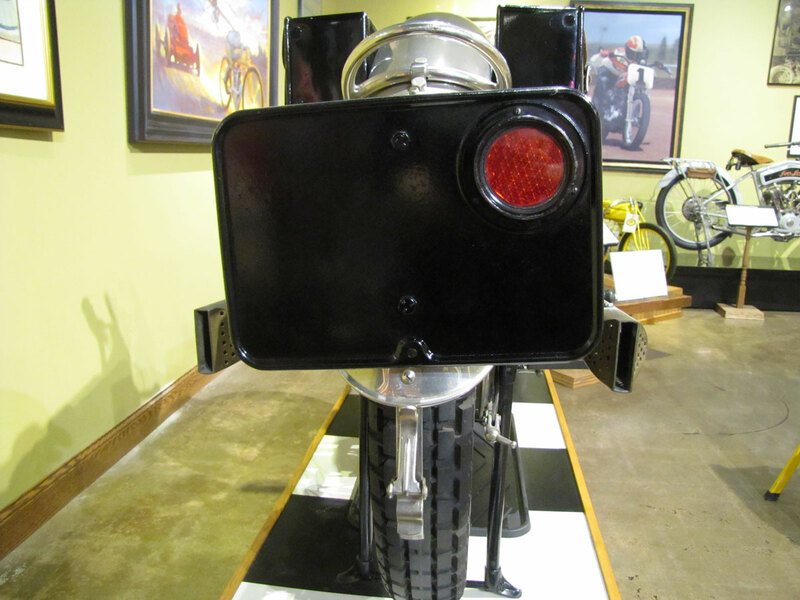 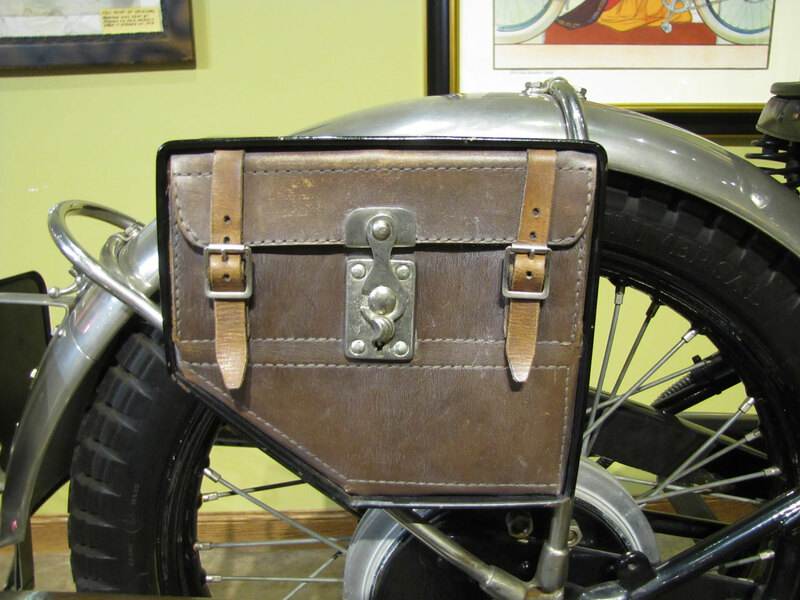 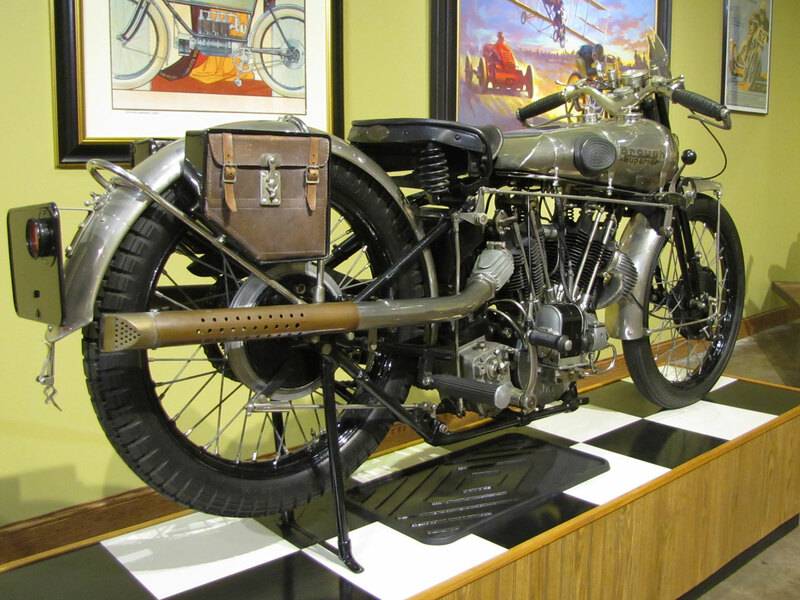 Brough made motorcycles most would agree were “better than the sum of their parts.” Such was its sales success that when the bigger SS100 was launched in late 1924, the company was able to continue profitably in production through to 1939. 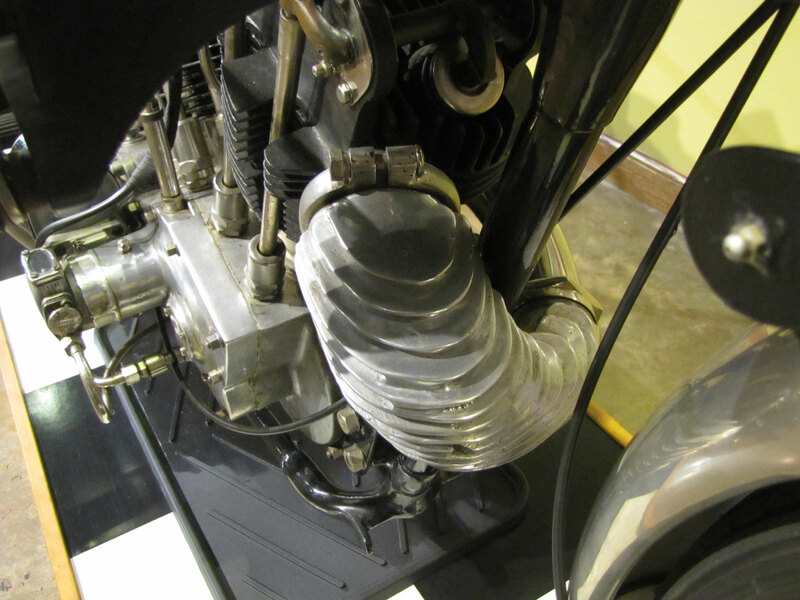 And tracing Brough design history, it’s interesting to see the wide range of engines, even chassis layouts Brough experimented with. 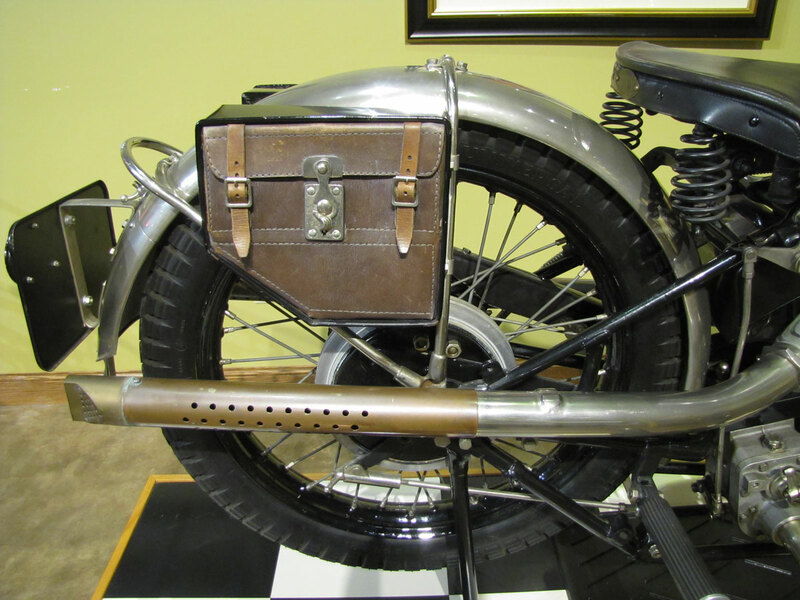 “Boxer” and in-line fours were used in prototypes. 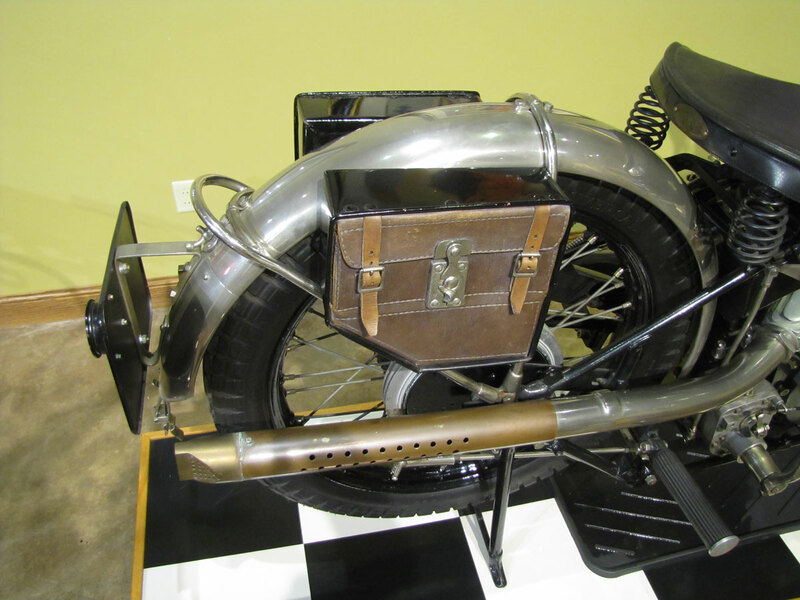 A recent auction brought to light a three-wheeled prototype for sidecar work that used a pair of wheels at the rear just inches apart! 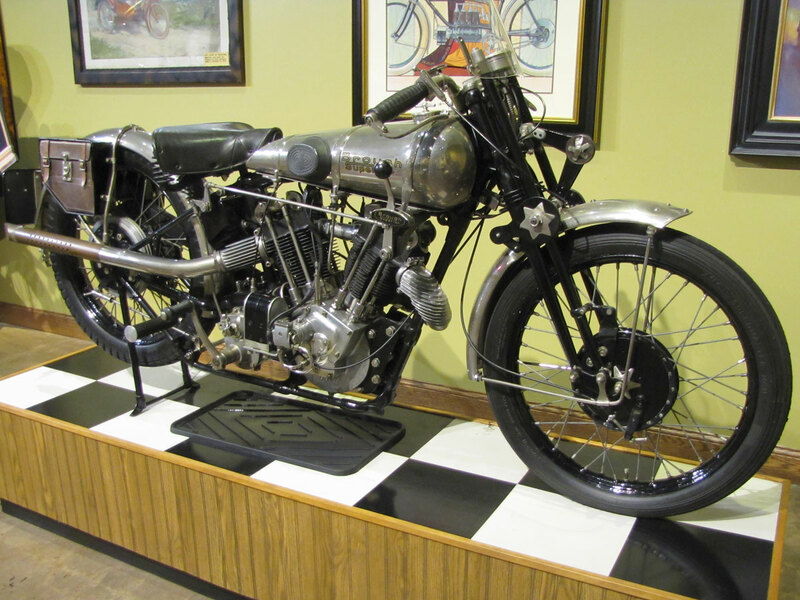 Interestingly, Brough’s most prolific year was in 1927 with a total of 226 motorcycles built; this SS100 was approximately number 383 somewhere between 1924 and 1940. 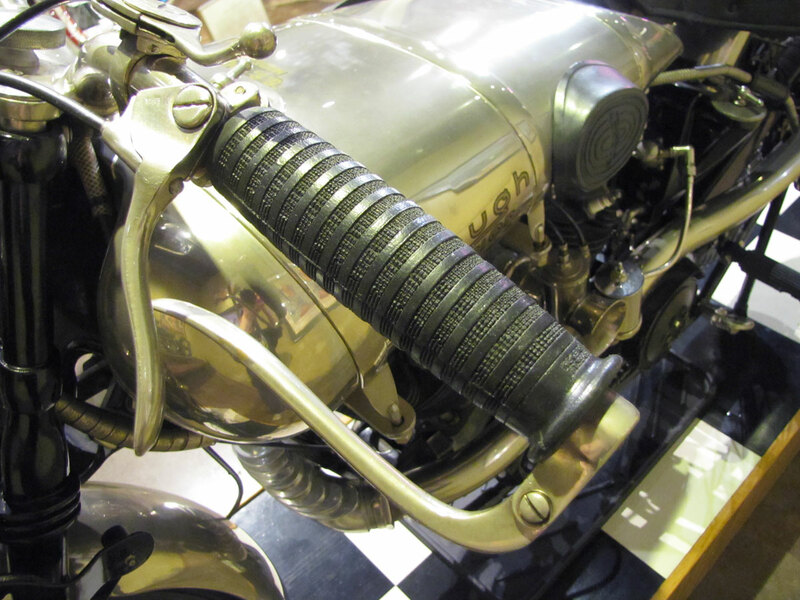 Broughs were made from 1921 to 1940 with World War II halting production. 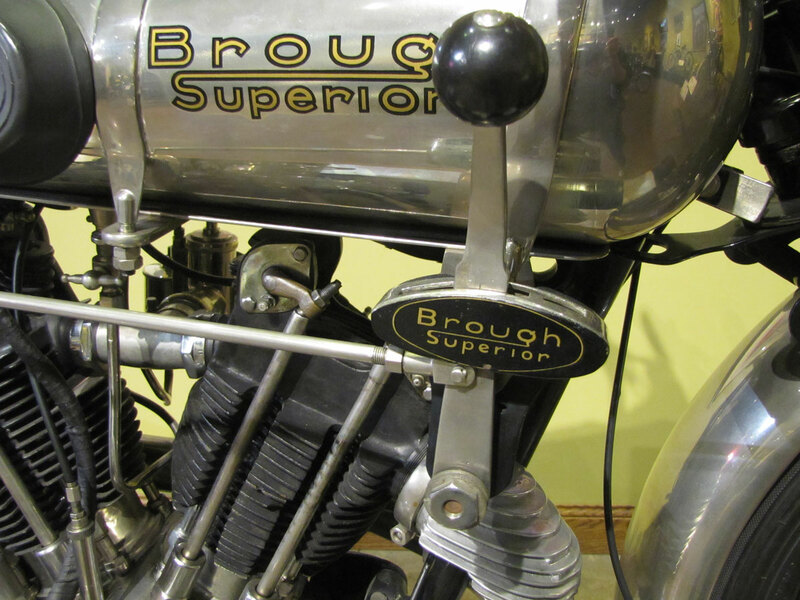 Since Brough relied on other makers for engines and temporarily there were few after the War, George Brough’s company ceased production permanently. 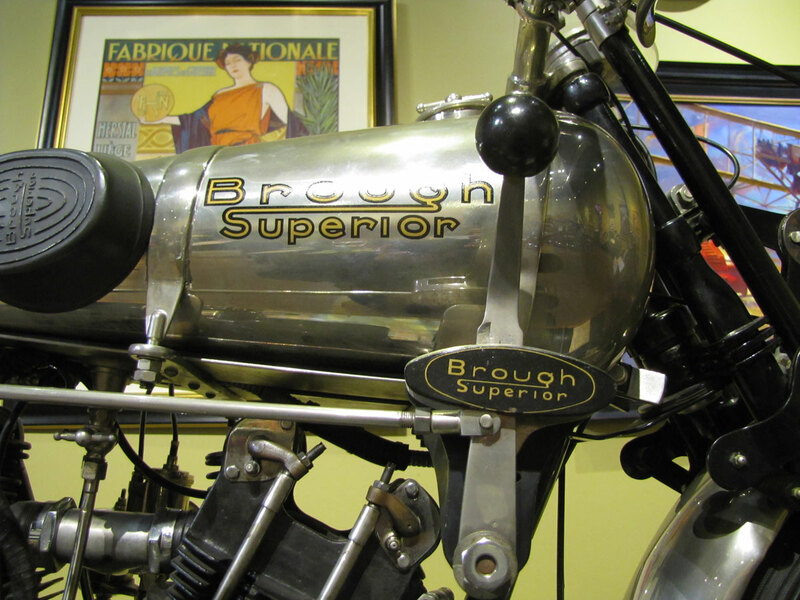 Capitalizing on a great history, much like Polaris has done with Indian, today a firm with rights to the name is once again building Brough-Superiors, thoroughly modern motorcycles which bear an outward resemblance to the originals. 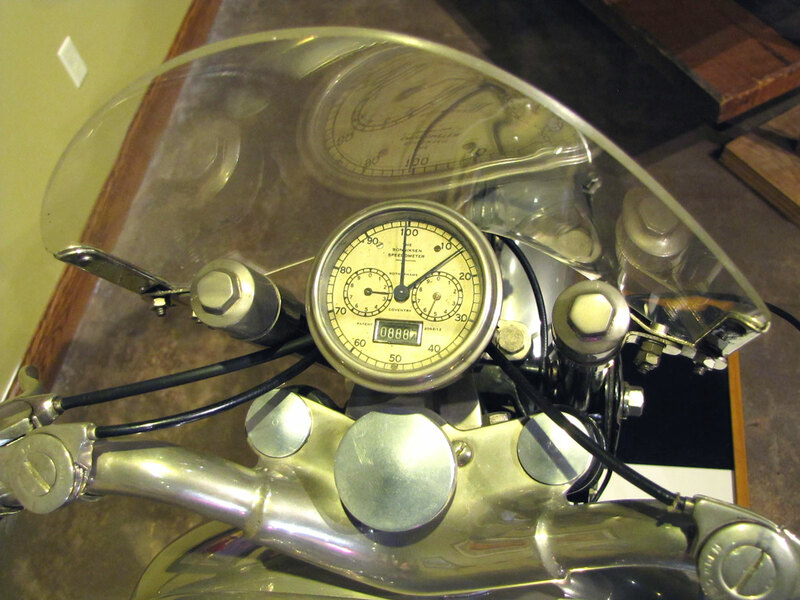 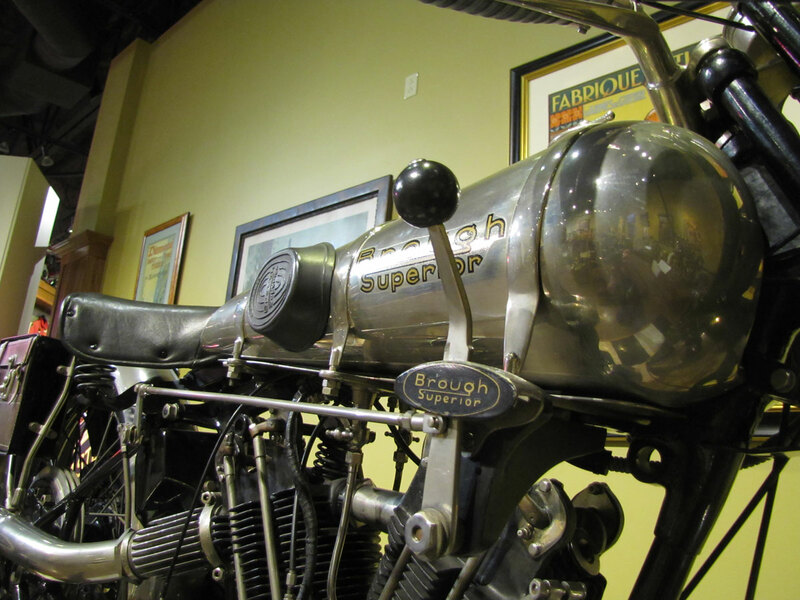 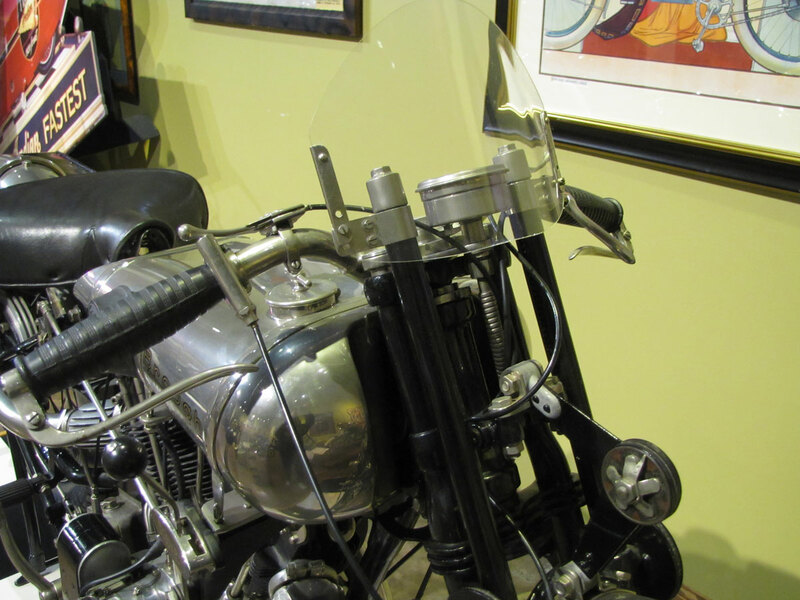 The Brough-Superior Pendine is located in the Best of the Best gallery and was always one of John Parham’s favorites. 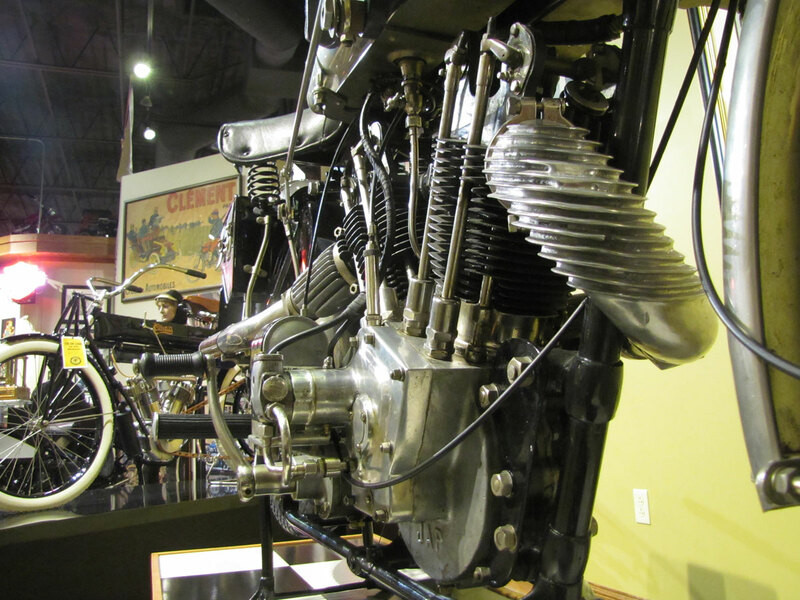 In the background you can see other “best” machines including the Curtiss, Thor, Reading-Standard, Sears, Iver-Johnson and John’s personal yellow Panhead.